The Club Series Elliptical Cross-Trainer is the award-winning home version of our popular club model now with iPod® compatibility. 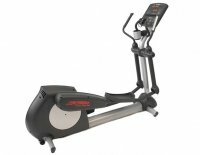 It's a towering icon that represents the very best in elliptical technology. The result of extensive research and testing, the Club Series delivers a remarkably pure, natural elliptical motion. Try it for yourself and you'll see why people who use it often forget they are exercising so intensely.